Cut the tomatoes in half crosswise. Put tomatoes in a foil lined pan and brush 1 tablespoon of the olive oil over the tomato halves. Place under the broiler and roast them, turning with tongs as the skin begins to blacken. This will take about 15 minutes. Remove most of the blackened skin. Pass the roasted tomatoes through a food mill into a small bowl. Set aside. In a 3-quart saucepan warm the remaining 2 tablespoons of olive oil over medium heat. Add onions and 1 clove of the garlic, sauté until soft. Add zucchini and bell pepper, and cook 2 to 3 minutes without browning. Add corn, jalapeno pepper, paprika, thyme, oregano, and the roasted tomato mixture, and cook for an additional 2 to 3 minutes. Add chicken stock and salt and pepper to taste. Bring to a boil, reduce the heat, and simmer partially covered for 45 minutes. In a small bowl, combine the remaining garlic and yogurt. Set aside. For garnish, combine the tomato, olive oil, and vinegar in a bowl. Salt and pepper to taste. Serve the soup hot; swirl in the yogurt mixture and top with the tomato garnish. 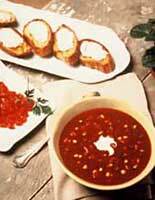 Serve with Italian Style Tomato Toasts.